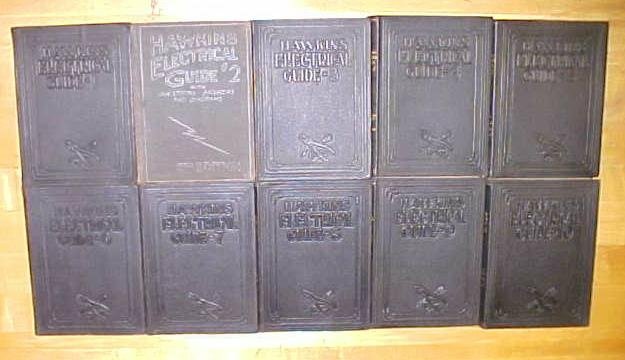 This is a nice set of Hawkins Electrical Guides, Volumes 1-10, a complete set, all were copyright in 1917. 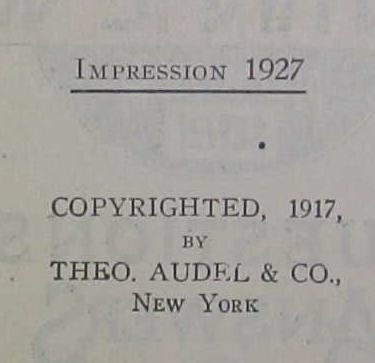 These are printed from 1923-27. The volume No. 2 is a few years older than the rest of the set, it is marked "IMPRESSION 1923-24", where the other 9 volumes are marked "IMPRESSION 1927". As you can see, there is a difference in the appearance of the cover on the Vol. 2, but otherwise is the text printing is the same as the 1927 printing, so the set is complete with the noted cover difference and printing date of volume 2. Although these quality made reference guides are named Hawkins, they were published by the same publisher as the later Audels guide sets (publisher Theo Audel, New York). The Hawkins set are quite hard to find in good condition, as their soft covers were a bit thinner that the later Audels guides, and a bit more delicate. This set was well cared for, but not without some wear as noted. They are all in good, to very good condition with a leather like cloth cover in black with gold gilt spine lettering and pages edges. Good bindings and hinges, clean pages with minor yellowing, no writing noted, except 9 of the volumes have the past owner's name written in on the inside cover, minimal edge wear, the inside cover pages seem a bit more darkened than the text pages, otherwise very clean inside. We do note some of the volumes have lines running down the spines, this is from holding the book in the fully opened position over the years, the spines otherwise are very good on most, a few with light wear, lettering looks to be about 90% intact overall. 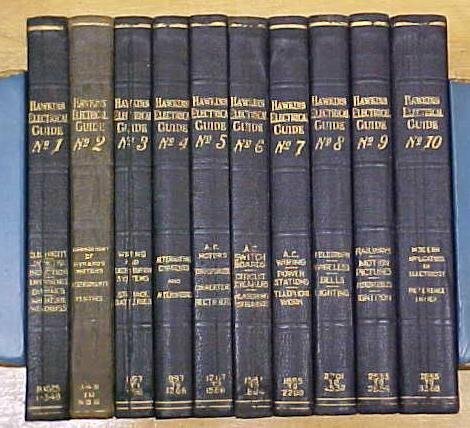 Hundreds of pages, with thousands of diagrams, pictures and instructions on about every known subject on electrical work in this period, including: Conductors, magnetism, induction coils, The Dynamo, The Armature, Windings, Commutation, and the commentator, brushes, and brush gear, armature construction, motors, galvanometers, ammeters, voltmeters, heating or motors, inside & outside wiring, underground wiring, alternating currents, transformers, converters, regulating and indicating devices, power stations, the telephone, telegraph, key, electric bells and lighting, electric railways, motion pictures, gas engine ignition systems, electric cars, electric elevators, cranes and pumps, and more! Perhaps the most complete library written in it's time! 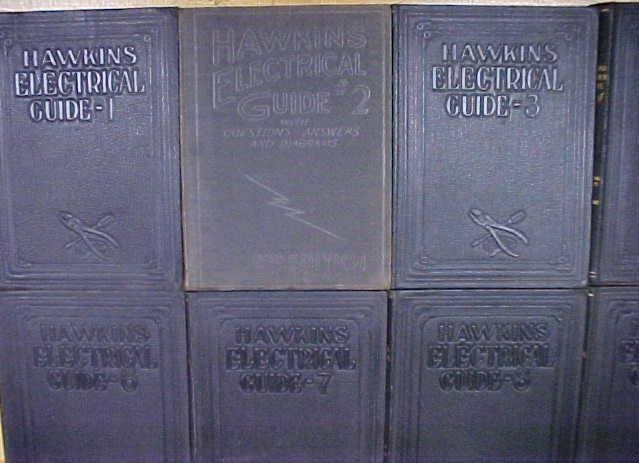 Items Similar To "Hawkins Electrical Guide Set of 10 ca. (1923-27)"
Hawkins New Catechism of Electricity Leather Rare!